I had set up my mind of using cardboards as the frame/skeleton of my couch from the very first beginning, the problem was the material that covers the frame. However, I then found out it was difficult to get this material in stores and was also worried about if it would be strong and durable enough to hold human bodies. Thus, I gave up this material and moved on to a new option—bubble wraps. Since they are very commonly seen and used, they are way easier to find. I first bought 3/16” bubble wrap and tested it. It was amazingly strong and since the bubble size is rather small, it is thus more flexible to cut. Hence, I decided to use it for my scale model of the library as well as the first layer of my couch. 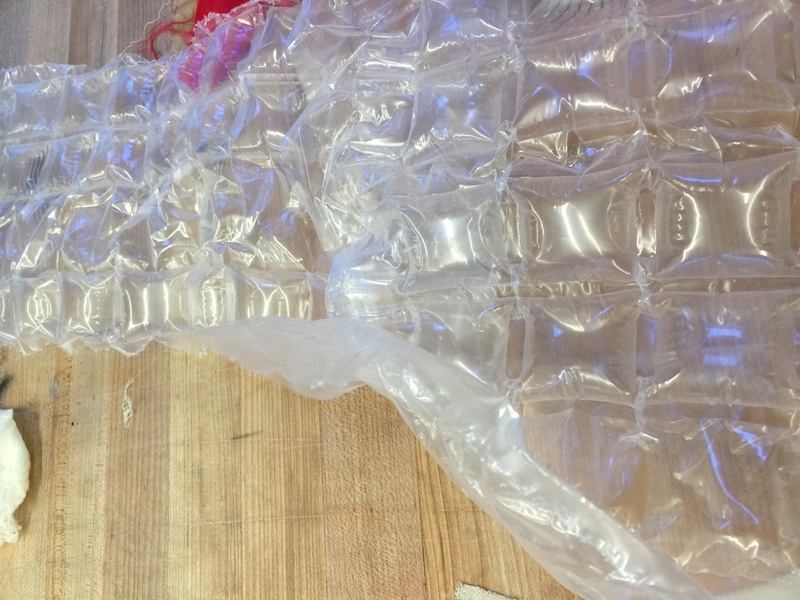 However, for the second layer, the layer that will directly connect with human bodies, since part of my purpose was to serve comfort and softness, I preferred to use bigger bubbles than 3/16”. I looked up in stores and the biggest size I found was 5/16”, which was not as big as I wished. I then searched up online and found the largest size bubble wraps: 1/2″, this was the size I wanted to use.